The buzz started on Monday: an alert reader (and Wilshire bike commute champion) notified Streetsblog that the sharrows on Motor Avenue disappeared between Venice Boulevard and National Boulevard, a three quarter mile stretch of mixed residential and commercial development, during a recent repaving. Nonetheless, the mood was optimistic. Initial road striping after the repave hinted that the four lane street would be shrunk to two lanes with bike lanes on each side of the street. Yesterday it became official: Motor Avenue is on a diet. 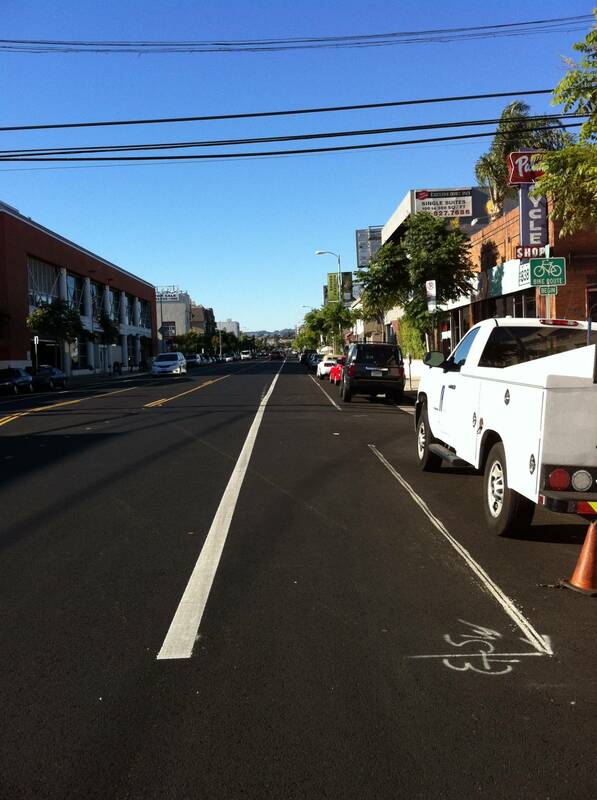 With the support of Councilman Paul Koretz and the Palms Neighborhood Council, LADOT and the Bureau of Street Services quickly re-striped Motor Avenue this week. Interestingly, the repaving that triggered the road diet doesn’t extend for the entire length of the diet. The road has not been repaved between Palms and National, but BOSS grounded out the old road markings, including sharrows, and replaced them with the bike lanes. This section of Motor Ave. will not be repaved until a bridge over at Exposition is rebuilt, though many commuters contend the road needs a new surface today. Bridge construction should begin by the end of this month and could take two years. I’m shocked! I think irate Westside drivers make actually go all Englander on this road diet and attempt to reverse it. But I hope not. Motor is a huge cut through and traffic stacks up here, so this is pretty bold. That said, if you take this facility North to it’s terminus on Pico Boulevard in Century City, you find yourself dumped on a traffic sewer with high speeds and nowhere else to go. Speaks to the need for connectivity of facilities. This Motor Avenue resident is delighted! 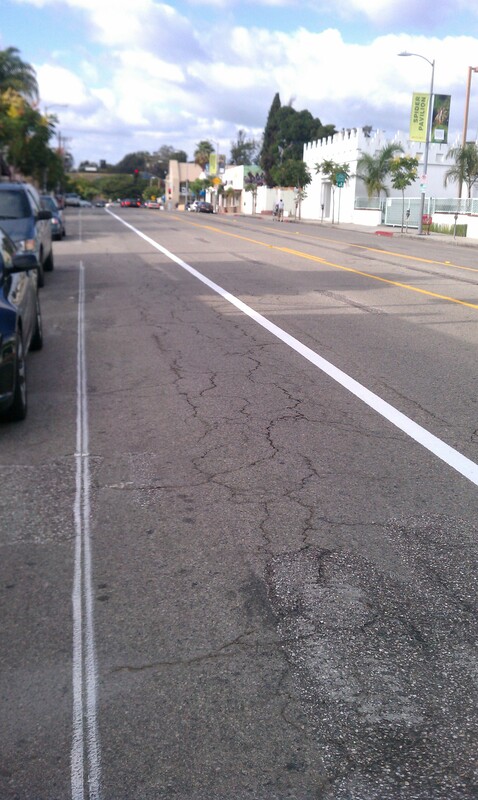 LADOT did diligence and secured support from Palms NC beforehand. The Motor Ave Improvement Association also supported the diet. Thanks to all who helped make this happen! As a former resident of a building half a block off Motor, I’m delighted as well! This makes total sense, as Motor has this exact same configuration anyway from National up to Manning, and traffic always backed up where the two northbound lanes merged at National. It never made sense to treat Motor as a major traffic artery for five blocks between Venice and National, only to become a collector/neighborhood street through Cheviot Hills. There’s a small neighborhood business cluster at Motor/National that includes some restaurants with sidewalk tables and not a lot of off-street parking. Hopefully they get an uptick in bike-up/walk-up customers now that Motor will be a little less stressful for users of those modes. And yes, thanks to everyone who worked on/spoke in support of this project. I actually have little choice but to use this stretch of Motor in the mornings, and I also support the road diet. As Niall Huffman states, traffic already piled up South of National and the merge imposed significant delay. The delay should be the same now, but without the chaos of the merge. There is already a significant problem with people driving in the bike lane though. I would recommend a few weeks of heavy enforcement, or, eventually, crossing bulbs. Hopefully the zoning follows and this stretch evolves into something a bit more pedestrian/cyclist friendly. The bike plan indicates that Motor Ave could have bike lanes its entire length from Washington Blvd to Pico Blvd. If Measure J passes next month and the LA city council votes to issue bonds based on this future sales tax to repair roads, and perhaps sidewalks, then much more bicycle lanes could be installed faster and at a lower cost per mile. The bike lanes would be installed with the restriping after the road is paved in contrast to having to strip off the lane markers and put in the bike lanes using overtime on the weekend. Which is how the city did most bike lane installations in the past year. Bike lanes are more effective in attracting people to ride on them when they are used next to a low number of travel lanes and a light amount of traffic that is moving at a rate closer to the cyclists speed. So I’m glad to see bike lanes on a two-lane road. Plus, the bike lanes are unusually wide, which enable people to ride side-by-side, or well away from where parked car doors could be swung open. This also makes the bike lanes more enticing to ride on for a larger proportion of the adult population by lowering the stress level. That bike shop on the right is the oldest in L.A.
Much need and makes perfect sense –it’s not just the connectivity to Pico which makes this addition most interesting but Motor’s connectivity to Northvale.THAT’S the critical intesection there. Northvale will deliver all riders directly to the Expo Line’s adjacent bike path. Once Phase 2 is completed it will be a direct shot from Culver City to Santa Monica. In the meantime though how about another East/West route? Having a National Avenue bike line which takes riders over the 405 is very much in need. The only East/West routes are Venice and a half-assed Santa Monica Boulevard. National Blvd, Pico Blvd and Santa Monica Blvd are all on the bike plan for upcoming bike lanes. It’s not a diet it’s a Road BUFFET™!! Lots of yummy transit options! NICE! Looks like it connects Venice to future Expoline stop. Bravo! Traffic might be stacked up at first, but once cut through traffic re-routes, it will be fine. Good! Motor and Venice is an intersection where people routinely get crazy and aggressive. It’s about time something changed there. This is a much needed improvement. Motor is a major cut through for bikes, not just cars. This will make riding much safer, and the will make the car traffic much more orderly as it will be one lane through the entire length of the road. on this stretch of Motor. This is more about property values, don’t kid yourself. It’s also added twenty minutes to everyone’s commute. I’d like to see some before/after numbers on the amount of delay the road diet has caused. Twenty minutes over less than a mile of road sounds like a wild exaggeration; that’s the kind of congestion that happens on Wilshire in the vicinity the 405. Even at the morning peak, I’d bet money that it only takes a couple of minutes longer compared to the prior configuration.